2.0 litre, 2WD, SOHC i-VTEC engine generates 156 PS of power at 6,500 rpm with 190 Nm of torque at 4,300 rpm and gives a mileage of 13.7 kmpl. 2.4 litre, 4WD, DOHC i-VTEC engine produces 190 PS of power at 7,000 rpm with 226 Nm of torque at 4,400 rpm and offers a mileage of 12 kmpl. CR V’s biggest competitors are Q3, Santa Fe, Fortuner and Trailblazer. Hyundai Santa Fe comes equipped with a 2.2 litre CRDi diesel engine - 197 bhp of power with a torque of 436 Nm. Mileage: 14.7 kmpl for manual and 13 kmpl for automatic. 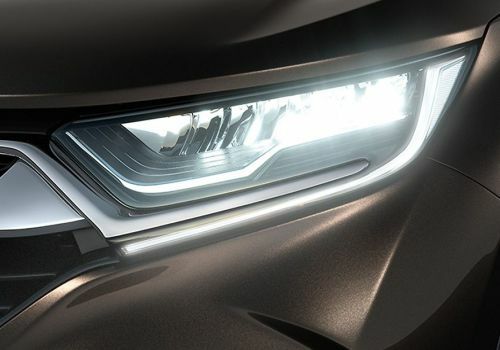 CR V has a bold headlight cluster which houses a projector headlamp and is placed in a swept back fashion. 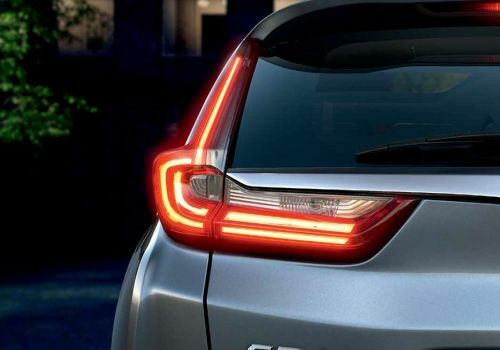 The side indicator merges in the side of the car to give it a smart look. 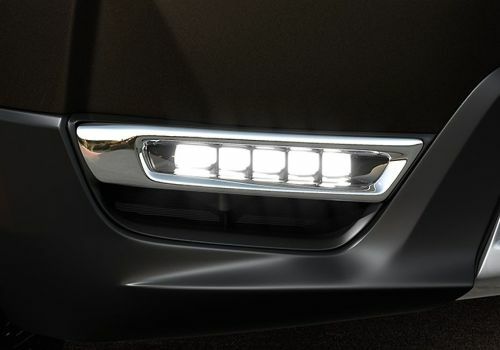 The fog lamps are circular and are placed in the bumper surrounded by air dams. 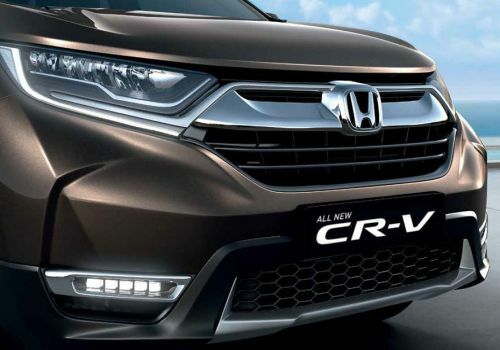 CR V has an aggressive radiator grille with three horizontally positioned slats. Careful addition of chrome at numerous places and insignia of the company neatly engraved in the centre gives an elegant and glossy look to the car. 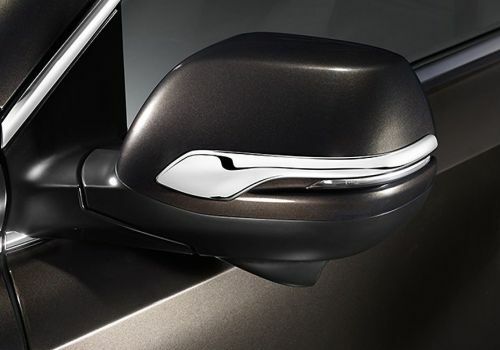 Keyless entry comes as a standard feature in CR V and all its rivals like Q3, Santa Fe, Trailblazer and Fortuner. CR V gets 225/65 R17 tyres wrapped on alloy wheels in all variants. Ground clearance of the car is 170mm. All the competitors of CR V are equipped with alloy wheels. Fortuner houses 265/65 R17 tyres. Ground clearance of the car is 220mm. Q3 comes equipped with 235/55 R17 tyres in the more powerful variant and with 215/65 R16 tyres in the other variant. Ground clearance of the car is 170mm. Santa Fe gets 235/60 R18 tyres. The car sits 185mm above the ground. Trailblazer gets 265/60 R18 tyres. It has a ground clearance of 253mm. 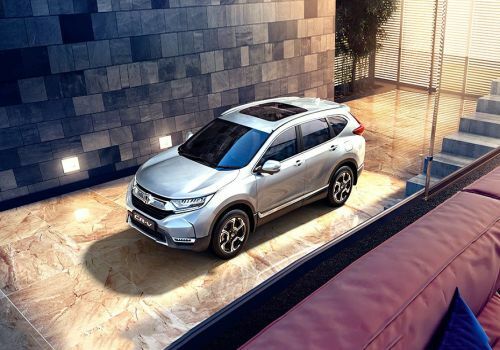 The dimensions of CR V are: 4,545mm x 1,820mm x 1,685mm (L x W x H). The car sits 170mm above the ground. 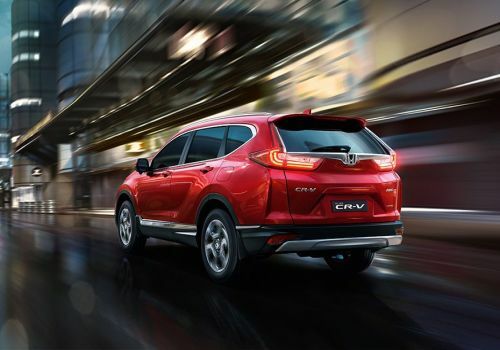 CR V comes in 5 colors: Orchid White Pearl, Carnelian Red Pearl, Sparking Brown Metallic, Urban Titanium Metallic and Alabaster Silver Metallic. Q3 is 157mm smaller, 11mm wider and 83mm shorter than CR V. Ground clearance of the car is 170mm. Santa Fe is 145mm longer, 60mm wider and 5mm taller than CR V. Ground clearance of the car is 185mm. Trailblazer is 332mm longer, 10mm wider and 166mm taller than CR V. Ground clearance of the car is 253mm. Fortuner is 160mm longer, 20mm wider and 165mm taller than CR V. Ground clearance of the car is 220mm. CR V, all round at the bottom quarter is wrapped in cladding which is cleverly used to give a 2-tone paint scheme to the car. 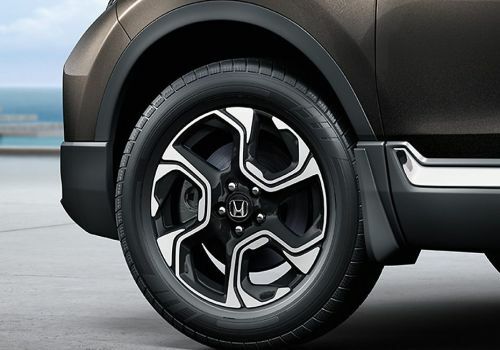 CR V comes equipped with front and rear disc brakes. It features ABS+EBD with Vehicle Stability Assist and Hill Start Assist. All the competitors of CR V house front and rear disc brakes. Fortuner comes equipped with safety features like ABS+EBD with brake assist, vehicle stability control and shift lock system. Q3 comes equipped with safety features like ABS, ASR, EDL, ESC and hill start assist. Santa Fe gets ABS, EBD, ESC, vehicle stability control, hill start assistant and brake assist. Trailblazer features ABS with EBD, ESC, Traction Control, Hill Start Assist, Hill Descent Control, Cornering Brake Control and Panic Brake Assist. 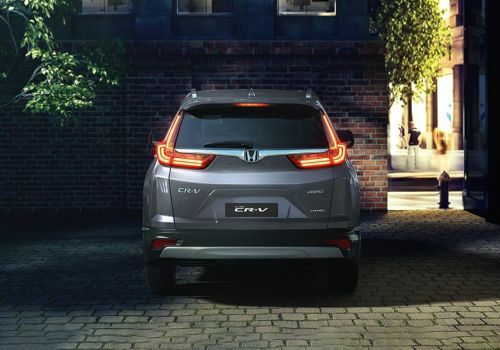 The tail light cluster on CR V is a wrap around unit which meets a body line on the side profile of the car. The unit is dominated by brake light which goes up to the roof. The clear lens section is placed at the bottom of the cluster and houses indicator and backlight. CR V can carry a luggage of 490 litres that can be extended by folding the rear seats. Fortuner can carry a luggage of 296 litres. Q3 has a luggage carrying capacity of 460 litres. Santa Fe can store 500 litres of luggage. Trailblazer has a boot carrying capacity of 205 litres than can be increased to 1830 litres by folding the second and third row seats. CR V and all its rivals like Q3, Santa Fe, Fortuner and Trailblazer feature rear parking assist. 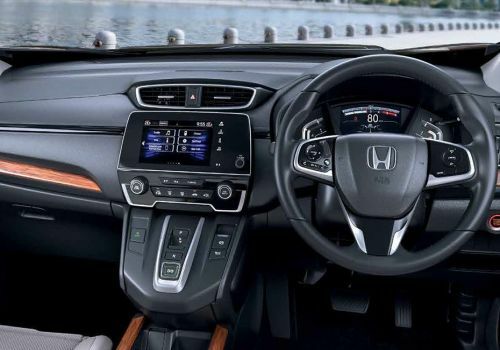 CR V houses a tilt and telescopic steering wheel. The 3-spoke steering gets mounted controls with company’s insignia at centre. 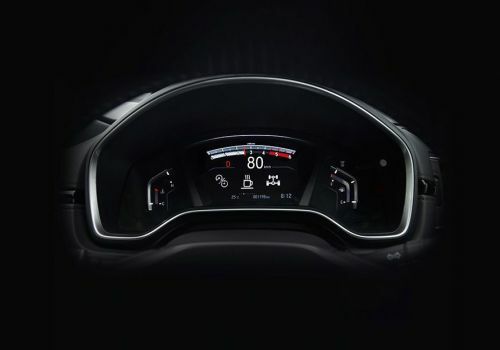 The instrument cluster houses circular dials for measuring rpm, speed, fuel and temperature of the engine. It also has electronic trip meter, driver seat belt warning notification and many other such functions for keeping the driver updated. CR V comes with an option between a 6-speed manual gearbox and a 5-speed automatic transmission. Fortuner comes with an option between a 5-speed manual gearbox and a 5-speed automatic transmission. Q3 comes equipped either with a 7-speed S Tronic automatic transmission or a 6-speed manual gearbox. Santa Fe houses either a 6-speed manual gearbox or a 6-speed automatic transmission. Trailblazer gets a 6-speed automatic transmission with Active select. The top end variant of CR V comes with an Audio Video Navigation (AVN) system, which has 6.1 inch advanced touch screen display. It has various features like Siri eyes-free voice recognition, HDMI video compatibility and Bluetooth connectivity. Other variants get an integrated music system with speed volume compensation (SVC). The controls of this audio unit are mounted on the steering wheel for added convenience to the driver. Below this are present controls for AC system with a small display in the centre. CR V gets all four power windows as a standard feature. CR V has got numerous storage spaces in the form of cup holders, storage space in doors, glove box and space in dashboard. CR V and all its competitors like Santa Fe, Q3, Fortuner and Trailblazer feature rear AC vents. The rear seats of CR V are foldable to further increase its luggage carrying capacity. CR V is equipped with dual front, side and curtain airbags as standard. Fortuner is equipped with dual front airbags. Q3 houses dual front airbags with front side airbags and head airbags for optimum safety. Santa Fe gets dual front airbags as standard and features side and curtain airbags in the top variant. Trailblazer comes equipped with dual front airbags. CR V features an 8-way power adjustable driver seat with lumbar support. Trailblazer, followed by Fortuner, leads the pack as far as legroom is concerned. 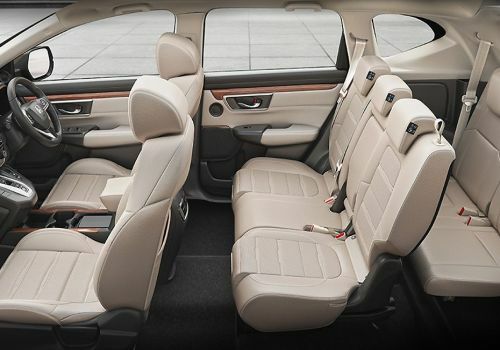 Santa Fe is the most spacious while CR V is the least spacious when three persons are to be accommodated at the rear seat. CR V, along with Q3, features an electric sunroof among all the SUVs in this segment. Fortuner, Santa Fe and Trailblazer do not get a sunroof.